Terma Easy ONE designer electric radiators offer a practical heating solution for small bathrooms, washrooms, or en-suites. Featuring a narrow design and slim width, these designer towel rails can be installed in the tightest of spaces, providing warm towels and independent bathroom heating from a playful, cubed design. Download or view the Easy 200 x 960mm assembly instructions & technical drawing here. Download or view the Easy 200 x 1600mm assembly instructions & technical drawing here. Terma Easy radiators are rated IPX5 and must be professionally installed by a qualified electrician in a suitable bathroom location. Always defer to the manufacturer’s guidelines about the bathroom suitability of any product. For further installation information, please see the assembly instructions and product literature above. Terma Easy Sparkling Gravel Electric Towel Rails come with an 8 Year Manufacturer’s Warranty on the towel rail and a separate 2 Year Manufacturer’s Warranty on the One heating element. Terma Easy Designer Electric Towel Rails are available with free next working day delivery. Next working day delivery is available when you order before 12pm (excluding weekends). 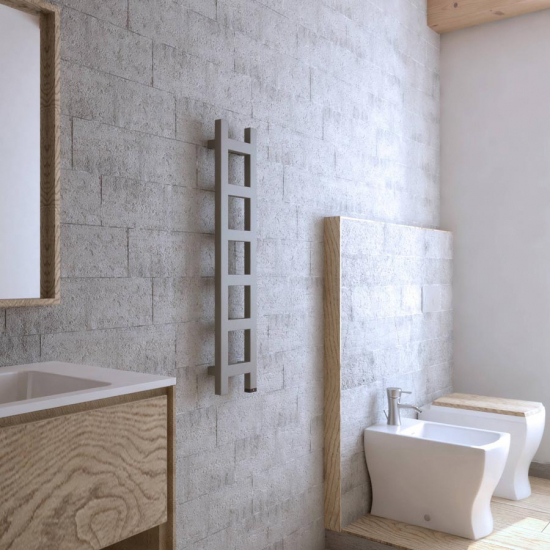 Terma Easy Designer Electric Towel Rails offer a unique bathroom heating solution for the modern home, with their slender frame and cubist aesthetic. Finished in sparkling grey, Easy electric towel rails are the ideal choice for contemporary homes with limited wall space. Terma Easy electric towel rails are equipped with an integrated “One” heating element which offers effortlessly simple push-button control. Push the base of the heating element once to heat at 45°C, twice to heat at 60°C, and a final time to turn the towel rail off — an LED light at the base of the element changes colour so you can tell with a quick glance what setting you’ve chosen. Terma Easy towel rails also come with a timer function that can be used to set the rails to turn off after a period of 2 hours; a useful feature for warm days when you need dry towels but don’t want to heat your bathroom. Frost protection is also included to prevent your pipes from freezing when the ambient temperature of the rails drops below 6°C. Terma Easy Designer Electric Towel Rails have an IPX5 protection rating, making them suitable for installation in bathrooms, provided they are hardwired by a professional electrician.